McDonald’s global turnaround is coming to fruition. The global re-vitalisation is being driven by the new management headquartered in Chicago. There are numerous lessons that can be learnt on how big companies can successfully implement a culture of innovation. In March 2015, Australian Food News reported that McDonald’s had experienced a decrease in global comparable sales of 1.7 per cent in February 2015. This was a continuation of a downward trend. At the time, McDonald’s said its performance reflected the “urgent need to evolve with today’s consumers, reset strategic priorities and restore business momentum”. 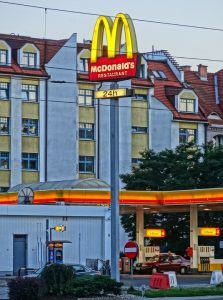 Whilst announcing the drop in sales in March 2015, in the same month, McDonald’s appointed a new Chief Executive Officer, Steve Easterbrook, and hosted a ‘Turnaround Summit’. Since then, McDonald’s has began taking action, beginning to refranchise 4, 000 of its stores globally. The chain is also starting to cut administrative costs and it recently announced it will be moving its headquarters from the suburban Oak Brook to inner-city Chicago by 2018. Some analysts have said this will be a good move to help the company attract young, innovative thinkers whilst CEO Easterbrook himself has said the McDonald’s brand is on the move in more ways than one. “Moving our headquarters to Chicago is another significant step in our journey to build a better McDonald’s,” he said about the headquarters move. McDonald’s in the US have also made changes similar to McDonald’s in Australia recently, trying to go healthier and more gourmet to help appeal to the modern consumer. In June 2016, it introduced salads to its US menus containing red leaf lettuce, kale and baby spinach. The changes appear to be paying off for the fast food chain with its share price rising by 25 per cent in the last year. Create your tastes menu – In 2015, McDonald’s Australia launched its ‘Create Your Taste’ menu which lets customers customise their burgers with wide range of gourmet ingredients. ‘How very unMcDonald’s’ advertising campaign – In 2015, McDonald’s Australia launched a large scale marketing and advertising campaign with the tagline “How very unMcDonald’s”. The aim of the campaign was to show a new McDonald’s with its gourmet ‘Create Your Taste’ burgers that are delivered to customers at their tables. Loaded Fries – 2015 saw McDonald’s Australia also launch “Loaded Fries”, another other more gourmet offering with customers able to have guacamole and salsa and bacon and cheese instead of just the usual ketchup. Meat Pies – In early July 2016, McDonald’s Australia started trailing selling meat pies in some of its stores, further trying to expand the type of products sold by the chain.